The Climate Finance Group of Latin America and the Caribbean’s (GFLAC) analysis of public resources used to comply with the Nationally Determined Contribution (NDC) of Mexico demonstrates asymmetries between the allocation and prioritization of public budgets in the Transversal Annex of Climate Change (AT-CC) and in how much each sector spent on climate change from 2014 to 2018. To determine how national financing is aligned with climate change mitigation and adaptation goals, the public budget for climate change was analyzed in strategic sectors (energy, transport, residential and commercial, industrial, agriculture, forestry, and disaster management and prevention). For each sector, the resources assigned in the AT-CC were identified. A public expenditure analysis by function was then carried out—that is, spending directed to areas within the federal dependencies whose actions are directly or indirectly linked to positive impacts on climate change, independent of whether they are labeled as such. During the period of analysis (2015-2018), the resources assigned to “Annex 16 Resources for Adaptation and Mitigation” did not vary significantly. On average, the amount has been 47,089,416,554 pesos annually. The year with the fewest assigned resources was 2017, with 36,878,401,378 pesos; 2018, however, saw an increase of about 20 million pesos. For the sectors analyzed, those receiving the most resources were the agricultural and forestry/environmental sectors. It is worth mentioning that the budget of the forestry/environmental sector was cut by 50%, an alarming finding given that it is precisely the sector in charge of establishing and implementing measures to combat climate change. 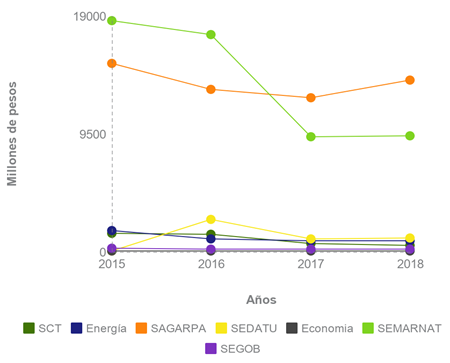 Meanwhile, the energy, transport and industrial sectors (identified as the largest emitters of greenhouse gases in Mexico) were among the sectors with the lowest budgets in Annex 16, as compared to other sectors. To conduct the functional analysis of the federal budget, the departments focused on implementing climate change actions in the energy, forestry/environmental and agricultural sectors were identified. 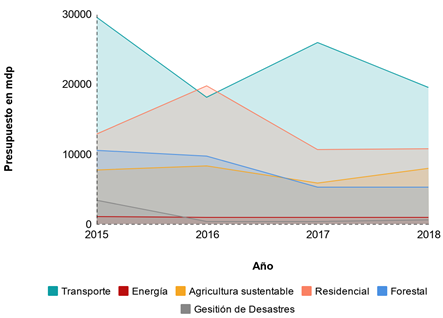 Meanwhile, in the transport sector, departmental budgets that focus on promoting mass and multimodal transport were analyzed; in the residential sector, actions to improve housing were examined; and, finally, for the disaster management sector, the budget for civil protection and disaster relief was analyzed. The results show that the sector that benefited most was the transport sector, followed by the residential sector. However, as in the analysis of Annex 16, the energy sector’s budget is insufficient to promote the transition to cleaner fuels and meet national climate change goals. This analysis highlights the need to align the public budget for climate change with the country’s objectives and goals, as well as to have a transparent methodology that allows for tracking and monitoring the use of resources. Additionally, public servants’ knowledge about the resources to implement climate actions must be improved. The study was prepared by the Climate Finance Group of Latin America and the Caribbean (GFLAC) and the Mexican-German Climate Change Alliance implemented by the Deutsche Gesellschaft für Internationale Zusammenarbeit (GIZ) GmbH, which forms part of the International Climate Initiative (IKI) of Germany’s Federal Ministry for the Environment, Nature Conservation and Nuclear Safety (BMU).